Okay, so I love camouflage but I am very picky about the print. With that said I get super excited when I find a print that fits me. So when I found this shirt from Madewell it was just what I was looking for! During the summer I like to pair camo with a lighter color to make it more suitable for summer. So I have paired it with a white pair of jeans, some neutral wedges, and topped it off with a hat! PS I have been loving this hat all summer! Also I have listed a couple items of my favorite camo looks & prints. What are your favorite looks? Are you feeling the trend? Such a great look! 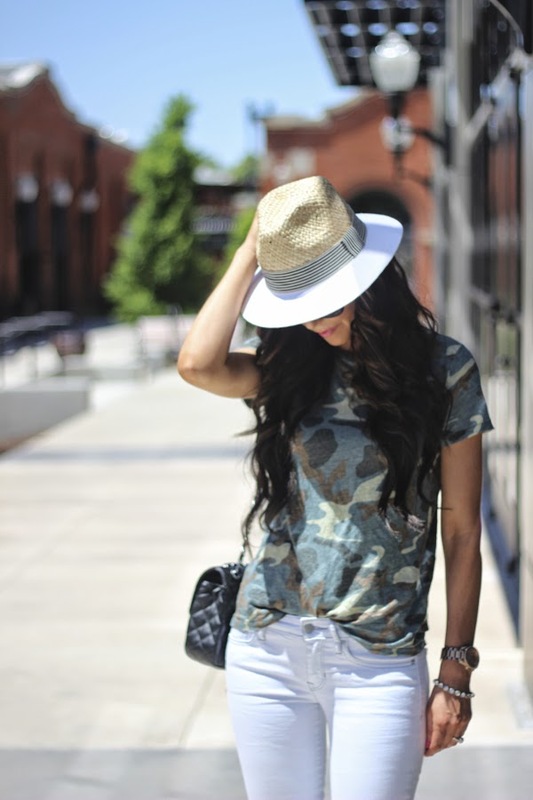 Love your camo tee! I have not really been on board with this trend but you may have changed my mind. You look darling!